Having prepared all the pieces of the coat’s body, I am now ready to start putting it together. Assembling the main body of the coat is relatively easy, the only real tricky bit is sewing the curved seams on the back. 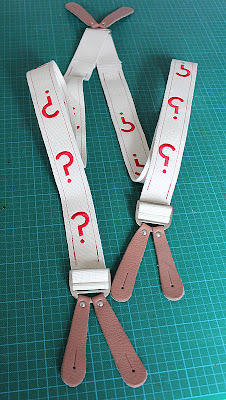 These need to be carefully eased in as the back has a longer curve than the side panel it is attaching to (see right). As you can see, the smaller side panel ripples a lot, so to control it I need to always have it the top. As a quick check to make sure each panel is coming together correctly, I have put the Calico test coat on my dummy, and lightly hung the new work in place like an enormous 3-D jigsaw puzzle (see left). Early stages, but things are looking good. 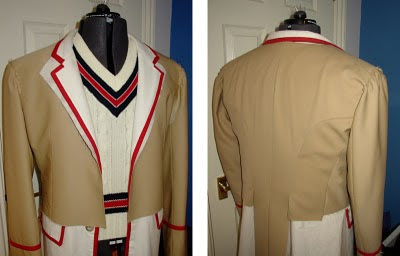 The making of the Five Coat’s sleeves are a little unusual, because of the ring of piping around the cuff. Usually I would sew the long seam up the back of a sleeve first, then while the work is still flat I can stitch the ease of the sleeve head. However, I need to disguise the join in the piping in the back seam, so I stitch the front seam first instead (see right), which I press flat. I had carefully worked out the level of the piping when I cut the pattern for the Calico Test, so I am able to accurately mark its position and pin the piping along its lower edge (see below, top left). I machine-stitch the lower edge (see below, top right) then fold the piping in half (see below, bottom left) and sew the upper edge to finish it off (see below, bottom right). I can then sew the long seam of the sleeve. It is critical that the piping matches up across this seam, so first of all I pin the ends of the piping together (see below, left) ready for sewing; I then sew only a few inches of the seam, surrounding the piping (see below, centre); this give me the chance to check I have matched it up accurately (see below, right) before sewing the rest of the seam from cuff to shoulder. Finishing off my work for today, I fill in some more pieces of my jigsaw puzzle and add the sleeves to the dummy (see below). It looks a little saggy and the shoulders, but that is because the sleeves are not even sewn in or padded. That will be my next job. Ah! 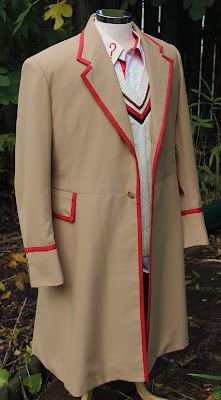 I havenʻt been checking your 5th Doctor Coat for a while. Itʻs coming on quite a bit since I last saw!